When printing tickets for your events or raffle tickets to host a fundraiser, you can always go for an option to customize your ticket designs. You do have the choice of buying some pre-printed raffle event tickets from the nearby store, but do think about the marketing opportunity you will miss if you do so. Using tickets customized with your company’s logo and a specific message will assist easy brand recall in the minds of your consumers. Not only will they relate the ticket to the specific event or the prize but also to the sponsor of the initiative that is “you”. Top Class Signs and Printing offers a range of ticket printing services that include custom event ticket printing. Send us your own graphic design or let us create a one-of-a-kind event ticket for your event. Turn a piece of paper into a collectible using our full color tickets. We make ordering and shipping of the tickets an extremely easy process, thanks to our fast turnaround. 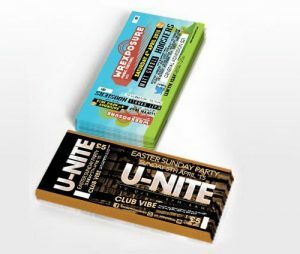 From full color custom event tickets to stock background tickets, thermal or offset printed tickets, we print them all. We can also include ticket numbers and optional foil security seal if you would wish to have them on your custom-printed tickets.